The Hippocrates Oath might be lying dormant in today’s commercialised health care, yet this head and neck surgeon goes beyond the call of duty. Dr Vishal Rao was the recipient of the Who’s Who In Health Care in 2011 by an international organisation, and is now researching on a ground-breaking “magic bullet” for cancer. He also spearheads a high power committee against tobacco with the government and is working with WHO against tobacco while juggling his role as a surgeon and oncologist. The doctor who wears his heart on his sleeve gave up a family hospital in Mangalore to pursue this calling that goes beyond just medicine. 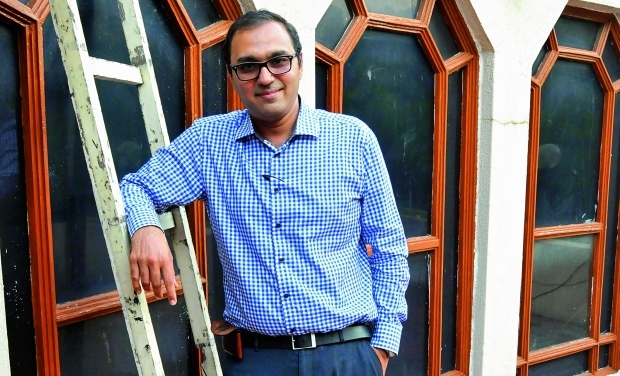 The surgical oncologist, a gold medallist, travelled as an idealistic student, with two sets of clothes to Tata Memorial Centre in Mumbai — straddled with doctoral degrees from Belgaum’s Jawaharlal Nehru Institute of Medical Sciences College’s KLE University and did the unthinkable — he hung around Tata without a job, broke without a stipend, before he was inducted into the Tata Fellowship programme. “I just asked them to let me hang around, learn, and it was a touching experience,” says the 37-year-old doctor who works at HCG in Bengaluru. A maverick and rebel in the cushy confines of traditionalism, he became a spiritually-aware powerhouse of learning — with over 20 medical papers, his work with the government on tobacco prevention is slowly creating a ripple of change. So, the earnest doc decided to be the change. The Arya and Rao Carotid tumour classification is named after him and radiologist Dr Supreetha Arya. “I am now working on a magic bullet on cancer — a theory in carcinogens with chemists and HCG’s help. It will change the science of oncology if let out. Many are not allowed to research about this in the West as it will disturb a powerful industry,” he declares. The doctor who can’t wait to take his Suzuki Intruder onto the open highway, searches rock lyrics for philosophical answers, and then is adept and nimble behind his surgical avatar, as he searches for scientific ones. All this, while he gets ridiculed and humiliated — “People laughed at me when I classified the tumour. I’ve also been thrown out of offices thanks to my tobacco drive,” he adds, “I went beyond books like Devita, the bible of oncology. My teachers inspired — Dr Arvind Desai, Dr B.M. Hedge, Dr Anil Dcruz, director Tata Hospital. Dr Ajai Kumar, chairman HCG played a key role in moulding my vision in career and research. A teacher in Belgaum advised me to pay it forward, so I did,” he adds. The doc, who listens to Journey, and has a special place for Guns N’ Roses Axel Rose and Slash, has taken up cannabis’ medicinal cancer-curing properties in research. The multitasking man also volunteered at villages through a Satya Sai Baba charity to understand realities of tobacco. “Oncology is a very depressing field — you might not be able to do justice to more than two-thirds but I had a genuine connect,” explains the doctor who went to the University of Pittsburgh early on, as a visiting scholar and had a life-changing experience — he met Dr Stan, the then director of Brentwood Medical Centre who gave him a place to stay — his home! Seeing him perplexed at a stranger hosting him, Dr Stan showed him reports and said, “Dr Rao, I had stage Four-C colon cancer.” Rao was confused, “‘I am a head and neck surgeon, I don’t know how I can help.’ He asked me to read the reports — they were dated 10 years ago! It struck me then that I had been looking at oncology as staging, mechanically. He told me one forgets to see the patient — I am living example that you can overcome cancer. Today, Dr Stan is 74, runs the treadmill better than I can!” shares Vishal. He is now creating a prosthetic to help patients without a voice box speak — aspiring to make it for Rs 500 instead of Rs 30,000. “The basics of research is to define the question,” he stresses. “We spend billions on antidotes but we are busy selling the poison — it’s a funny paradoxical truth. Dr Pankaj Chaturvedi inspired me to look beyond the problem. In India, 40 to 50 percent cancers are due to tobacco, and in head and neck it’s 95 per cent,” he reveals, adding, “I also working with the union government on implementing the Cigarette and other Tobacco Products Act. I am not anti-tobacco, I am pro-health. My humble request to all tobacco owners is to look at ground reality. We need to work together to raise corporate spiritual social responsibility. Some owners have been my patients and they are good human beings who’ve never thought about the health perspective,” he appeals. The good Samaritan is going to become a father soon and he says it’s his wife Megha who organises his zeal and ideas to fruition. Vishal also believes in holistic treatments, “The New England Journal of Medicine quotes that up to 30 per cent patients go for alternative therapies without telling their doctor. Why can’t we acknowledge that in India? We can respectfully talk to each other for the benefit of the patient, leaving our individual medical egos behind,” he implores. A spiritual man, he concludes, “An atheist is not a man who does not go to a temple, church, or synagogue. An atheist is one who does not listen to his inner voice.” Let’s hope that people are listening to theirs.